Question: What do you do when you’re out of lavash, you’re not near a store that sells it, and you don't feel like making it the traditional way? Answer: Make a stovetop version! I've been baking my mother-in-law's wonderful recipe for lavash for over 35 years. It's very different from the thin, wrap-able lavash most are familiar with. Because it's time-consuming and requires a fair amount of oven time, summertime is not the best time for me to make it. So, I decided not to make it. To make authentic, old-world lavash, one would need a tonir (an in-ground clay oven), a hot fire, a cooking partner, and a lot of patience. Nope, not going to happen! Luckily, I have a another recipe - handwritten, slightly-tattered, and from an unknown source - for ‘Stovetop Lavash’ that I’d never before made. 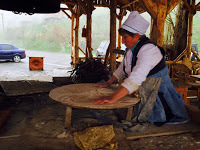 After having seen authentic lavash being made from scratch in Armenia, I knew this preparation would be better handled with another pair of hands, so my plan was to make this when my daughter came to visit, but time did not permit. Preparing this alone, I knew I had to work quickly and keep distractions to a minimum. 1. In a mixing bowl, whisk together flour(s) and salt, until well-combined. a dough is formed. If dough is too dry, continue to slowly add some of the remaining ¼ cup water until a non-sticky dough is formed. 2. On a lightly floured work surface, knead the dough until it is smooth. Divide the dough into 8 equal-sized pieces; roll each piece into a ball. it over the rolling pin and lay it into the hot pan. 6. Continue the process until all pieces have been rolled out, cooked and completely cooled. My Evaluation: While striving to thinly roll the dough, be very careful, as it can easily tear. The final product looked and tasted like lavash, but the texture seemed a bit chewy. Perhaps, if I’d used only all-purpose flour, that might have made a difference. 1. The cooked, cooled lavash should be lightly spritzed or sprinkled with water on both sides. (Using a bottle with a spray nozzle works nicely as long as you don’t get the lavash too wet.) Stack the pieces with either parchment or paper towel placed in between. Lightly cover the stack in plastic wrap for about an hour. 2. Remove the parchment or paper towel pieces. If the lavash pieces are large, fold each in half or into quarters; individually wrap the folded pieces in plastic, and place in freezer bags. Freeze until needed. 3. Getting ready to serve: Remove as many pieces as you need from the freezer. Thaw at room temperature for about 30 minutes while still wrapped. 4. Serving suggestions: Cut into smaller pieces as part of a mezza platter, or use as a wrap for kebabs, cheese etc. When you try this, I'd like to hear your thoughts! 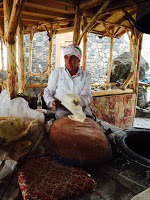 Hey Robyn, one way of storing the lavash that I saw done in Armenia is to let it dry out, then stack it in a ventilated location away from pests. When you want to use it, you sprinkle with water,let it soften a bit, roll it in a towel to let it finish softening, and voila! Though I have to say that the freezer method is a lot more economical in terms of space. You're right, Ara. That's been a tried-and-true technique for ages by our elders. Thanks for mentioning it! Awesome recipe, made it for the first time. Thank You, I'm trying to learn some dishes so I can prepare them for my relatives when they come in January.